After the freezing blast that swept across Europe and kept us on land, temperatures are rising again. Jump in your wetsuit and get your gear ready for an exciting foiling season! This year Phantom is offering you a series of opportunities to try our products, and an international sailing event to compete with other foiling fans. Don’t miss any of that! Phantom International welcomes Jessee Besson as a sailor and sales officer. Jessee was born on a boat and grew up sailing in French Polynesia: dinghy sailing, catamaran, windsurfing, surfing… He is an absolute waterman with a commercial experience as a sales officer at Naish France, and a Flying Phantom experience: “I have sailed with my brother Billy on the FP Essentiel and on the FP Elite, and also with Thibaut Vauchel. I love these boats and I believe they have a promising future. They are well designed and built, which make them efficient and safe. 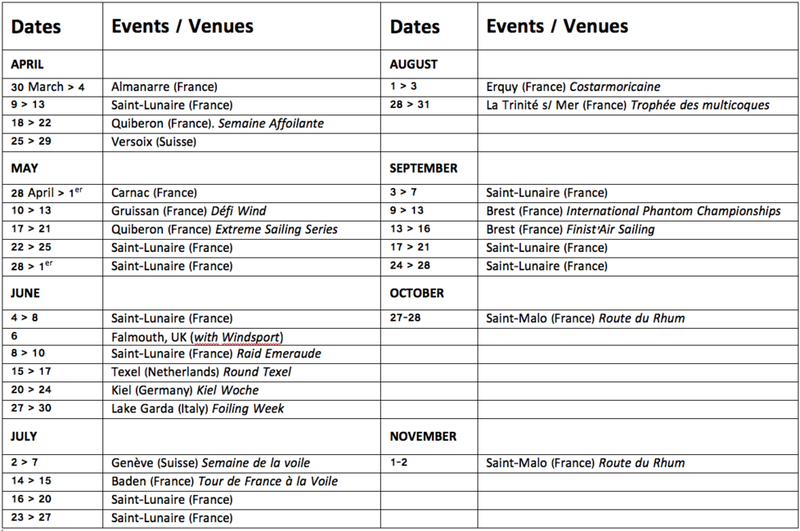 I look forward to going on the road to share my passion and experience with sailing and windsurfing fans". In the next few months, Jessee will take the FP Essential demo boat and the Iris windsurf sails and boards on the Phantom European Tour. Phantom International is proud to announce new partnerships with three Sailing Academies: in La Baule (FR), Saint-Cast-Le-Guildo (FR) and Falmouth (UK). These academies have chosen the Flying Phantom ESSENTIEL to organize sailing courses and training, and contribute to the development of foil-sailing. Windsport Falmouth, UK. Known as being a centre of excellence for race catamaran sailors, Windsport has recently launched the Windsport Multihull foiling Academy. They have one FP Elite and one FP Essentiel. More info: https://www.windsport.co.uk/windsport-foiling-academy/ On the 6th June The Windsport Multihull Foiling Academy will be holding a multihull foiling day. 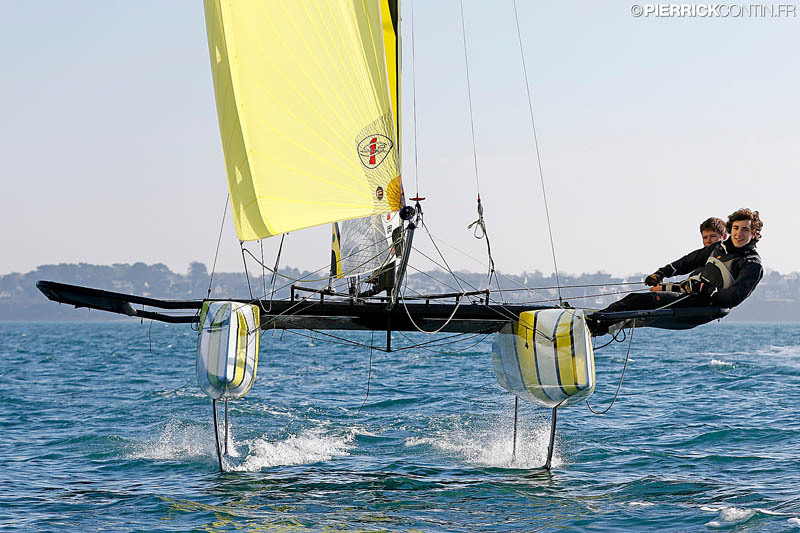 Sailors are welcome to contact the Windsport Foiling team to arrange a test or introduction session on the FP Essentiel. Sessions start from a taster session @ £85 per hour to a 3hr introduction session £225 with our leading foiling coach Tom Phipps. The FP Essentiel May batch is sold out. We are now taking orders for June delivery (ex-factory in France). Don't procrastinate if you want your boat ready before the summer. The first batch of the FP Ultimate is sold out too. Next batch available for delivery in June. As announced in our latest newsletter, the Iris boards are now ready to be shipped. We have sailed the combo Iris 6.6 with Iris foiling board medium and reached a top speed of 29.6 knots! Amazing performances for platinium pre-peg carbon sandwich boards Made in France. Order now! This new Phantom event is open to all FP Elite and Essentiel owners and will give international sailors the opportunity to compete in various race formats such as long distance, course racing and stadium racing. Inspired by the 90’s Hobie Cat events and boosted by updated race formats, the Championships will gather amateur sailors together with semi-professional and professional sailors during five days. For the 4th consecutive year, the best Flying Phantom sailors will compete on some of worlds best sailing venues. Like last year, the circuit is part of the Extreme Sailing Series. A fleet of up to 11 Flying Phantoms are scheduled to take part in it, and fans can expect some full-on racing from top international sailors, as this fleet adds to the on-water action at four of the Extreme Sailing Series Acts. The Swiss Association of Flying Phantom owners has just released the dates of the 2018 Swiss FP Series. There will be between 8 and 10 boats competing this year.